double-bluff, easily handled, fits in your pocket magic tricks. 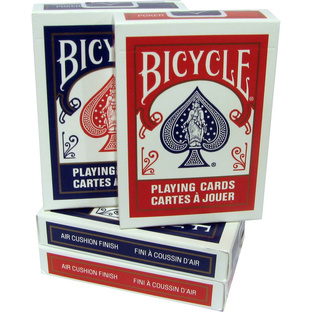 One card deck that performs 3 amazing (yet secretly simple) card tricks. For stage or walk around, big crowds or one-on-one, you’ll amaze them all. Trick One - Three audience members freely select a card. You successfully announce the selected cards. Can be done with the magician never touching the deck. Trick Two - A great trick for one on one magic experiance. Your new friend picks a card and, with out looking your select the exact card from the deck, with out looking. Trick Three - A good comedy gag or clown bit! Get laughs with the stupidly simple "Pick A Card Any Card" magic trick.